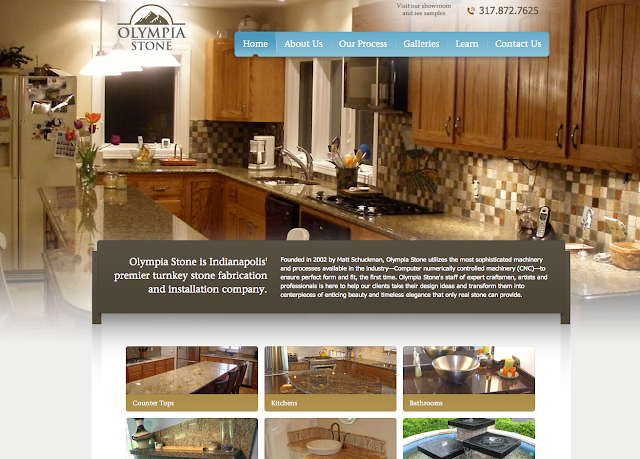 We launched a new website for Olympia Stone last week, and it can be viewed at http://www.olympiastoneindy.com/. TBH Creative was hired by Olympia Stone to make their outdated website more effective and attractive. 1. Allow easier in-house editing and additional pages/photos. The new website uses our custom Content Management System which will allow them to add new pages, edit content and even add new photos to their galleries. There is no limit, and they are currently working on additional pages to add. 2. Show off all their great work with a gallery and photos. We incorporated photos very prominently in their design as a full screen rotation. Large photos are a very popular current web design trend. In addition, we included galleries for major categories of their services (such as kitchens, bars, bathrooms). These galleries are linked in the navigation and right from the main page. 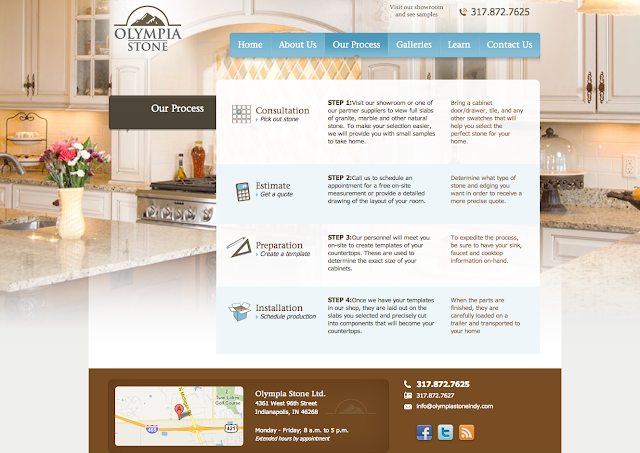 Olympia Stone's new homepage. View the site. One of Olympia Stone's interior pages. View the site. 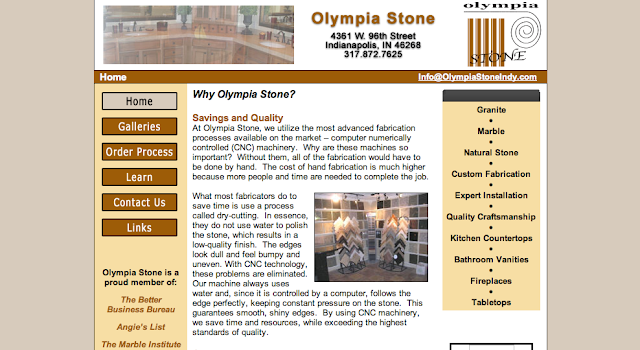 Olympia Stone's homepage prior to the redesign. In addition to the outdated graphics and small photos, the coding was very poor and used tables making edits more difficult. Founded in 2002 by Matt Schuckman, Olympia Stone utilizes the most sophisticated machinery and processes available in the industry—Computer numerically controlled machinery (CNC)—to ensure perfect form and fit, the first time. Olympia Stone's staff of expert craftsmen, artists and professionals is here to help our clients take their design ideas and transform them into centerpieces of enticing beauty and timeless elegance that only real stone can provide. Don't know where to start in creating a website for your business? Look no further! TBH Creative is located in Indianapolis, Indiana and specializes in web design, online strategy, and more! Contact us today for a web consultation.